There is a boom in building around Colorado Springs and that’s going to be good news for families who are looking for assisted-living facilities for their loved ones. There are six centers on the drawing boards for these specialized care centers that will add up to 400 living units to the area by next year. These aren’t your old-fashioned “nursing homes” but modern facilities with plenty of amenities. The difference is that with assisted-living the residents are given some extra help with making meals and getting around. These aren’t the only construction projects happening around Colorado Springs. It seems that everywhere you look there is a new home or restaurant being built. That’s good news for the local economy. It might also inspire you to get you own remodeling project under way. Fixing up your home is a terrific way to increase the value. This will be a big benefit when you want to refinance or ultimately put the home up for sale. Remodeling projects aren’t just limited to indoor projects like a new kitchen or extra bathroom. Many local Colorado homeowners are getting ready for the warmer weather by whipping their patios and driveways into shape. If some cracks have appeared in those concrete areas then you’ll need to patch them up before they get too bad or think about replacing the concrete. A viable alternative is to think out of the “cement box” with materials like pea gravel. You certainly won’t have to worry about a pea gravel driveway or patio getting ruined by rain and snow. 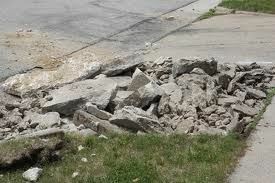 As you move closer to replacing any of your concrete sidewalks or driveways you’ll need to consider what you’ll be doing with all the old concrete you’ll be busting up. This is not something you can throw out with the garbage. Actually, you could but you’d have to bust up the concrete in really small pieces and then spread out the removal over several weeks or months. That’s because there is a weight limit to garbage pickups. You might be able to get away with this once but not what it would take to toss out an entire driveway of concrete. For that type of removal project you’re much better off hiring Junk King Colorado Springs. As their name implies, Junk King Colorado Springs specializes in all kinds of junk removal and chunks of concrete would certainly qualify as junk. Once the concrete is broken up the Junk King crew will have no problem loading it up onto the back of their truck and making sure it is disposed of the right way. That is a much better alternative than doing it yourself wouldn’t you say so? Whether you’re tossing out concrete or furniture or any other kind of junk, Junk King Colorado Springs is the only way to go. This entry was posted in colorado construction waste, Colorado Junk Hauling, Colorado Springs Hauling Service, Colorado Springs Junk Removal, Concrete Disposal and tagged Colorado Springs Concrete Disposal, Colorado Springs Concrete Hauling, Colorado Springs Concrete Recycling on February 27, 2013 by John Busby. Last updated August 2, 2017 .